In this part of the JQuery Video Tutorial I show you how to create all kinds of cool things using the JQuery UI and plugins. 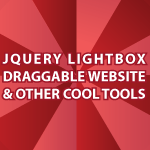 I’ll show you how to create a really nice JQuery Lightbox using fancybox. It has all the bells and whistles you want. I’ll then show you how to create a tab interface that is: draggable, resizeable, sortable, and more. After that I’ll create a really nice date picker that will impress and save your clients time. Like always, all of the code follows the video. Leave questions and comments below. btw, i’m a big fan of nlp. grinder and bandler. good stuff. frogs 2 princes, etc…. great for sales IF you can get face time these days! Glad you like the tuts 🙂 Yes NLP is extremely cool. I’m planning more videos on it soon. I’m going to be doing a WordPress Theme and plugin tutorial in about 1 week. Although I can’t get my gallery to work properly. I figured out that I can’t copy your code. To many weird signs follow. But when I print it down by hand I still can’t get my pictures to upload in an iFrame om the page?! I’m pretty new to this so I probably done something I will figure out in an hour or so. But do you have any tip? Derek-Great stuff! I am a photographer but never got around to doing a lightbox. What a snap! Thank you. The tab system was great as well. The site below has an interesting ap for jquery that you might want to do a demo on. A little involve but very cool. I’ve downloaded the files and am going to take it apart and put it back together using various company’s logos. Think it might be great as a promo tool and a way of data farming. Very good, please tap on your back from me. Great tutorial. Any chance of getting a video tutorial on uploading multiple images and display them immediately after the uploading is completed using jQuery? Sorry, I asked the same thing on youtube. Hope you don’t mind. Hi, What a great tutorial and a million thanks! Btw, is it possible to do away with the background overlay and make the fancybox draggable? Appreciate if could get an answer from you soon. You’re welcome. I think this should work. Well thank you. I’m glad you liked it. JQuery is a great tool. Java is kind of boring I agree. It is just an extremely robust language and after being asked many times I decided to cover it. Because I always try to cover everything completely, that is the reason it is dragging on. I plan on breaking everything up again and cover other topics very soon. it would be great if you can give me idea on DOJO vs Jquery .. Curiosity to know the tool you used for demo purpose.. I use JQuery, but I’m interested in covering many of the other Java frameworks available. I tend to cover fully developed technologies and shy away from anything that is fairly new. In the future that will most definitely change though. Your tutorials are outstanding! I’ve just covered them but I believe there is still a lot of work to do to master jQuery. At the beginning your videos seem to be extremely fast, so it’s hard to keep up. The funny thing is that whenever I switch to someone else’s tutorials I get the impression that they are a bit too slow. I got used to your style, I guess. So Derek, is it ever possible to receive any help from you if I face some difficulties with the code which I’ve been trying to put to work or I’ve found somewhere on the web? I can’t stand slow tutorials. I know I go a bit too fast, but that has become my style. I do my best to help out anyone that asks for help. The only thing I won’t do is homework. I get asked to do peoples homework all of the time. I also at times ignore big complicated questions. The reason why I do this is because all to often I’ll spend a half hour answering a question only to never hear from the person again. If I get a complicated question I just incorporate it into a future tutorial and figure that they’ll get their answer if they continue with the tutorial. My friend, I can understand you very well. I promise not to ask you for help with any kind of homework – I’m not a student and I don’t have such problems. However, there are some questions about jQuery that I will ask you soon. I believe you can help me… One day, when I build my beautiful website, you will be proud of your ardent follower. I promise. You have uploaded excellent tutorials on jquery, I love it and also recommend my friends about your website. You teach everything in detail and help understand the concept. well I was wondering is there anything in jquery that adds shadow to ,, tags, I have tried pShadow.js and it adds shadows only in bottom corners and bottom middle. what if I want to add shadow on left and right and also on top, just incase, and also I want to understand the concept behind it. Could you please upload a tutorial on this too. I would be greatly thankful. Thank you Derek on answering all my questions. When algorithm tut start?